MODERATOR MESSAGE:Use this thread for any discussion related to tyres. BUT I ABSOLUTELY AM AGAINST DOING ANY STRUCTURAL MODIFICATIONS TO THE BIKE, LIKE TO THE RIMS SWING ARM ETC. So plz tell me which is the max sized tyre I can fit, keeping the same rim on my p180dtsi, where can I do this (in mumbai), and the cost of the tyres. I read Hatari's discussion on how the engine is loaded when tire size is reduced. I dont wanna put any extra load on the engine whatsoever. Will my engine stay fine, as I am keeping the diameter constant (rim is the same) , or will it be loaded even because of a fatness increase. If this is so, I will drop the whole idea. What are the pros and cons of the following two types of tyres: those which have a "spiky" grip, like in dirtbikes and "bald" tyres like those in SBKs. Regarding the front tyre, I ofcourse am not gonna upsize it coz that will make handling heavier, but what abt same sized tyre with better grip? P.S: Prices May vary.. these were the prices i knew..any changes pls corect me!! I) Dunlop Monster..(800/- INR in delhi) if you have a bit of offroad on your dailly commute way..then its good.. 100% tarmac.. waste..
IV) Ceat: MOCROSS (1800/- INR in delhi): 100% OFF road tyre..useless for you..
rest ceat.. no much idea..
V) MRF Zapper Q..(12-1500/- INR in delhi): THE BEST FRO ZMA .. 120/80 section.. tubeless.. direct fit... no probs.. ultimate grip..even on water.. after Nylozapper FS and S,it is the tyre that gives the best water resource planning and awesome grip on water on tarmac..
VI) Pireli.. (18-2000/- INR in delhi) :Way to costly.. and gives you awesome grip.. but not on water,also a bit of soft compound..so wear's Off fast..
RALCO(650/- INR in delhi): Useless,this company earlier manufactured tyre for rickshaw's and cycles..with the brand name of "RALSON"..
Reason being: tryes very hard,and heavy,gives a lot of stress to the engine..god for person's who are learning wheeliee's ..
METRO CONTINENTAL(800/- INR in delhi): IF you put up in chhera punji or myswarryam..then this tyre is THE BEST ..
VEE RUBBER(17-1800/- INR in delhi):Very nice tyres.. awesome grip.. soft compound..provides a less grip when comes in contact with water + tarmac..
IRC: A mid stuff compound lasts for somewhere around 25,000 kms..
100/90 18" (Rear): 1200/- Tubeless and with Tube also Avail. 110/90 18" (Rear): 1400/- Tubeless and with Tube also Avail. 120/80 18"(Rear): 1700/- Tubeless and with Tube also Avail. Last edited by Samarth 619; 02-03-2015 at 12:11 AM. 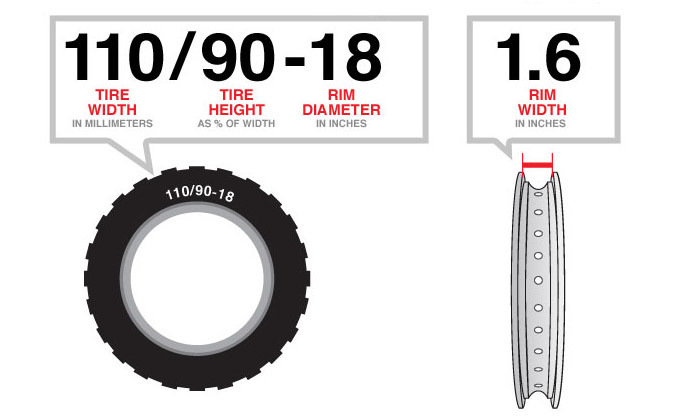 Reason: added image for tyre size explanation. TUHIN360 and Meet patel like this. i dont know abt the max tyre size tht can be put on the stock rim of 180dtsi. i suggest you choose the normal tyres instead od bubble tyres(dirt bike).The bubble tyres spoil the looks. The speed and acceleration and mileage will be affectedd. yup the engine will be stressed, so u have to perform re-sprocketing, if the tyre size is reduced or increased. tanmay.. dont change ure tyres just for the sake of changing tyres. the Zappers on the 180 are good enough. they'r meant for racing.. and have NO GRIP in the wet. this depends on the tyre ( if u change it ).. so there is no fixed formula..
when i changed my CBZ sprocket.. this is the article i referred to..
just found the link... it has all u want to know about sprocketing ! Thanxalot guys. I'll let u know if I change it. I was referring to a discussion "Pulsars Vs Fiero F2" in which there's an interesting debate on Radial tyres. Which of the tyres in the indian market, or the imported ones mentioned above in this forum Duro/Maxxim/Barracuda are radials?? if not are there any radials available here?? please clarify Hatari, u have advised me not to put slicks, and then go on further to say the other ones are not for city riding, and have only cons... Then which ones do I use (I use the bike a lot on highways)... Am I missing something here?? ?